None of us like to do them, but there’s a reason for the saying that the only two constants in the world are death and taxes. They’re a pain, complicated, and none of us like to see just how much of our money has gone to the government throughout the year. 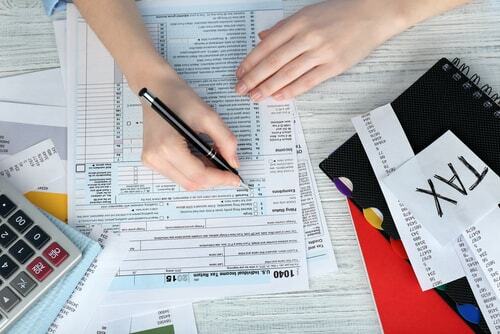 Still, there are distinct advantages to getting a head start on filing your taxes. Getting ready beforehand means you won’t be scrabbling at the last minute looking for the right documentation or that receipt you know you put somewhere, but can’t remember exactly where. How do you get ready for tax day, though? Don’t worry, we’re here today to walk you through the process. The quickest and easiest way to get ready for tax day is just to file your taxes online with a service like turbotax that’ll walk you through all the steps involved one by one. Often they’re free, or close enough that it’s worth saving yourself the hassle for just a few bucks. They’ll automatically find any deductions that you can apply for, and often you’ll get at least a few hundred dollars for your troubles. Hopefully, you’ve been saving receipts and pay stubs throughout the year, or at least have that information logged somewhere online. These are the two main types of paperwork you’ll need, but you may also need a 1099 form and W-2 and a few other forms of documentation. Essentially, any type of income or tax relief that applied to you in the last year you should try and gather documentation for. That can include alimony, social security, investments, and many more. Armed with all this information you should be ready to face your taxes. If you start filing early, you’ll have the added advantage that if you forget one of the above, or find a deduction you may be eligible for, you’ll have time to get the documentation to prove it. For most of us our taxes aren’t so complex that it’s worth seeing an accountant about them, but if you’re self-employed, own a small business (check out our article on how title loans can make yours thrive), or have made a lot from your investments, then an accountant can help you navigate through the tricky waters of deductions and hidden costs. Accountants are, after all, professionals, and filing taxes is what they’ve been trained to be able to do. No one likes taxes. No one. But that makes it only more important that you get them out of the way early to make way for more enjoyable parts of your life. If you follow the steps you should be able to do just that.